It’s been a difficult earnings season for companies as they haven’t been rewarded for beating near-term expectations. Investors are instead focused on future profits, which are expected to come under serious pressure. Goldman Sachs highlights the three forces clouding the outlook for future earnings, and recommends trades to help investors avoid the coming slowdown. After a streak of strong quarterly earnings, the air is starting to come out of corporate profits. It was inevitable, but that doesn’t make it any less painful for investors accustomed to continuously robust earnings growth. They’ve relied on it as the primary driver of stock gains throughout the nearly 10-year bull market, and old habits die hard. Sure, companies in the S&P 500 are on pace to grow profits at a more than 20% clip, which is still above the bull market average. But it’s the overall trend that has some experts worried. Goldman Sachs is specifically focused on three forces it says are putting serious pressure on profit margins: (1) increased tariffs, (2) a tight labor market featuring low unemployment and accelerating wage growth, and (3) rising debt costs — which are largely due to Federal Reserve interest rate hikes. Goldman has been paying close attention to corporate earnings calls, and those are the three headwinds that keep popping up. As such, investors are no longer rewarding companies that beat near-term profit forecasts. They’re instead more worried about what the future holds, and how the inevitable worsening of those three factors will play out in the market. 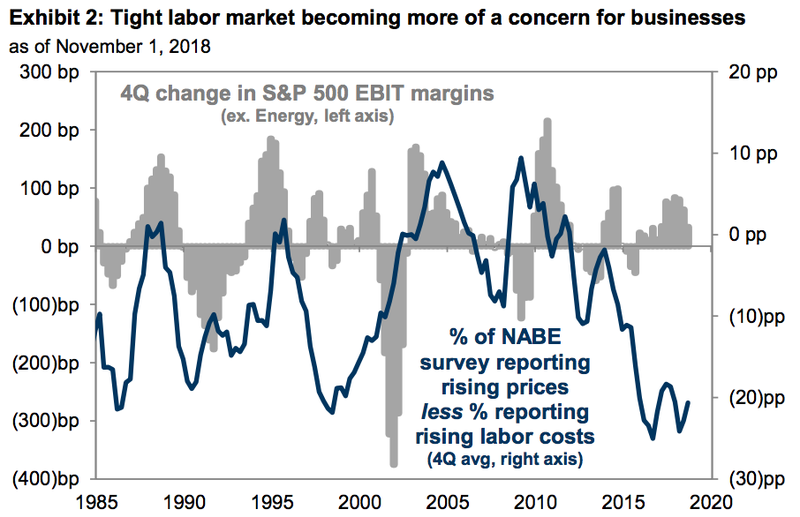 The chart below shows the recent worsening of corporate margins pressures as the labor market has tightened. As costs have risen, firms have largely been unable to offset that with price hikes — at least up to this point. Those type of conditions are a recipe for disaster for traders — especially those who have relied so heavily on earnings growth for the majority of the bull market. But Goldman says it doesn’t have to be such a solemn time for investors. They just have to recognize that the investing landscape has changed, and adjust their approach accordingly. In this case, that means identifying and loading up on shares of companies who are less exposed to margin pressures. 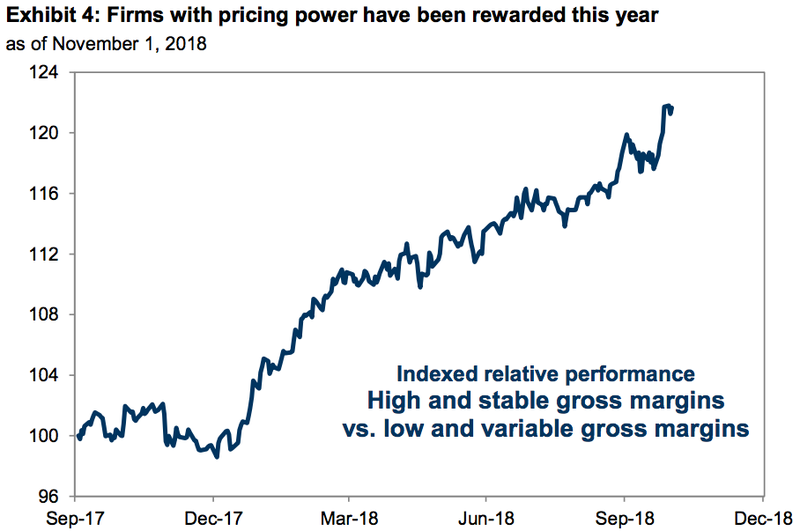 Goldman highlights two subsets in particular: (1) firms with strong balance sheets (as in, those not saddled by exorbitant debt) and (2) companies with strong price power. Both areas outperformed during Red October, or the turbulent period for stocks that saw major US indexes slip into correction territory. Since much of the market’s trepidation stemmed from a cloudy labor market outlook, the relative resilience of these types of companies was an encouraging sign.